Tablet stands can turn your tablets into interactive drawing palettes, easy to use musical instruments, or simply viewing screens for movies and your favourite TV series — shortly put, everyone has a use for a tablet stand, especially iPad users. In this article, we’ll try to guide you through finding the most suitable and popular tablet stand for an iPad. The first quality a tablet stand has to have is a secure grip: you’ll be using the device with your fingers, so it mustn’t fall off easily. Secondly, a good iPad tablet stand has to provide an adjustable viewing angle. Some applications are easier to use when the tablet is positioned in a landscape angle; a customisable viewing angle also allows adjusting the angle for your eyes. And lastly, an iPad tablet stand has to be portable and lightweight — you’ll definitely want to use your stand for conveniently using the tablet wherever you are. The Arkon Compact Tablet Stand is a portable and adjustable tablet stand that’s great for use with iPads. It grips the tablet well and supports multiple viewing angles, effectively making your iPad much more feasible for watching movies, reading sheet music, and drawing with a stylus or by hand – and all at a very democratic price. 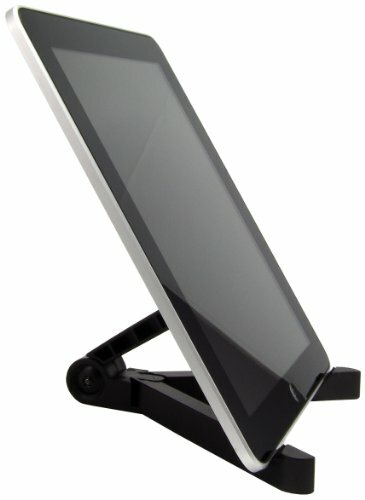 There is no surprise why this particular tablet stand is one of the most popular on the market. The Original Hebron is a portable iPad stand that’s easy on your wallet but grips the iPad hard. It supports a number of other tablets along the iPad, and provides a customisable viewing angle. The Hebron is neatly designed so that it complements the look of Apple’s fine tablets.